MOVE2010 took place in Frankfurt from 20-24 October 2010 and was organised by a consortium representing three international umbrella organisations in the Sport for All sector, besides the local host, the German Gymnastics Federation (DTB). Representing more than 200 associations worldwide, which in turn comprise more than 60 million individual members, the consortium enjoyed unprecedented legitimacy when it came to looking for common positions within the Sport for All sector. 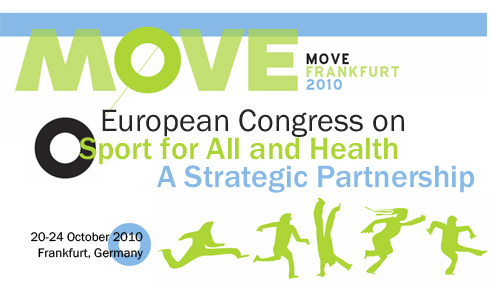 MOVE2010 highlighted the need for strategic partnerships between the Sport for All and Health sectors as they have fundamentally operated separately, with only limited recognition of their interdependence. MOVE2010 set out to unite the sectors and develop common strategies that are capable of addressing the health challenges of today. The congress served as a scene for national and international speakers to present and debate new strategies and understandings, highlighting examples of joint ventures involving sport associations, health professionals, political decision makers and private sector representatives.